There is an undercover war going on in America that impacts everyone’s life far more than the legal issues that typically grab the headlines. 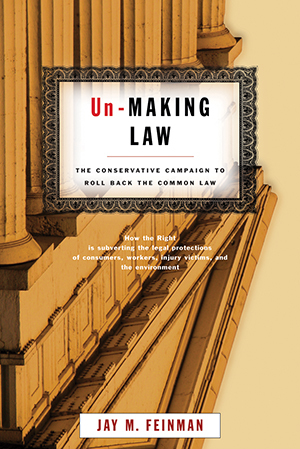 The conservative movement has been systematically turning back a century’s worth of the evolving gains and protections found in the common law-the areas of law that affect the everyday activities of ordinary people. Throughout the twentieth century, contract, property, and personal injury law evolved to take more account of social conditions and the needs of consumers, workers, and less powerful members of American society. Contracts were interpreted in light of common sense, property ownership was subjected to reasonable-use provisions to protect the environment, and consumers were protected against dangerous products. But all that is changing. Conservatives have a clear agenda to turn back the clock on the common law to maximize the profits of big business. Some significant inroads have already been made to protect gun manufacturers from lawsuits, enforce form contracts that prevent employees from suing for discrimination, and hamper the government’s protection of the environment against aggressive development, for example. More rollbacks are on the horizon. Although this aspect of the conservative agenda is not as visible as assaults on abortion rights and civil liberties, it may ultimately have even greater impact on our society. Jay M. Feinman’s book is an accessible, eye-opening primer, full of vivid examples and case histories-from victims of medical malpractice who cannot recover damages to people who relinquish their right to sue by applying for a job. The “All-American Blame Game” has corrupted our moral fiber-everyone is looking for a scapegoat to sue whenever anything goes wrong. Malpractice lawsuits have gone sky-high in recent years, forcing insurance companies reluctantly to raise rates and forcing doctors out of practice. Consumers and employees agree to arbitration because it is a much simpler, less expensive, and fairer way to resolve contract disputes. The government invades the rights of private property owners when it protects endangered species and regulates land development. "I highly recommend this book . . . It recognizes that tort law is not the only target in this radical campaign to reduce consumer rights. Today's neo-conservatives also seek absolute property rights and contracts free of government regulation. Feinmanís book is a thunderbolt. "Un-Making Law . . . points out that George Bushís agenda involves more than playing cowboy in Iraq and giving tax breaks to fat cats. It also includes enacting tort reform, which . . . would ultimately reduce legal protections available to ordinary Americans while increasing those same protections for HMOs, drug companies, and other manufacturers."